Valley Interior Systems was founded in 1981 as a union interior subcontracting firm specializing in drywall, framing, acoustical ceilings, and plastering serving the Tri-State area. In 1986 Bill Strawser bought Valley Interior Systems from his two partners setting the stage for tremendous growth and success. Joining Bill were his two sons, John and Mike, and Jeff Hudepohl, who previously worked with Bill. 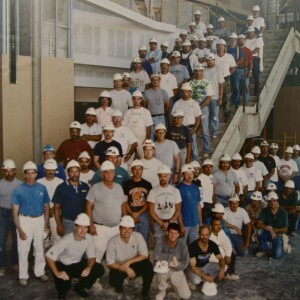 This core team, in addition to working on many marquee projects in the Greater Cincinnati area, began to define the principles of Valley Interior Systems that remain today. In response to numerous requests by general contractors, Valley Interior Systems expanded into other markets and cities beginning in 1990. Valley now operates offices with a full staff in Columbus, Dayton, and Toledo, Ohio, and Lexington, Kentucky, offering our clients unmatched dedicated service and quality craftsmanship. In 2007 the leadership team began defining its vision for further growth and success. As a result, the leadership team developed a company vision statement. That vision statement remains today and is a driving force for the continued growth and success of Valley Interior Systems, Inc.
We will provide a team of dependable and qualified professionals completing all projects safely, on time, on budget, with the highest quality by being proactive and providing solutions through open communication, utilizing training, technology and experience.